Whether gardening is your hobby or your livelihood, no garden toolset is complete without a garden hoe. It’s a classic, versatile piece of equipment that will make a world of difference in your garden. If you’re weeding, cultivating, or reshaping the soil, having the right hoe makes it quicker and easier to whip your garden into shape. Whatever your backyard aspirations are, we’re here to help you find the best garden hoe to meet your needs. The Flexrake Hula-Ho Weeder Cultivator is a great option for knocking out the weeds in your garden. 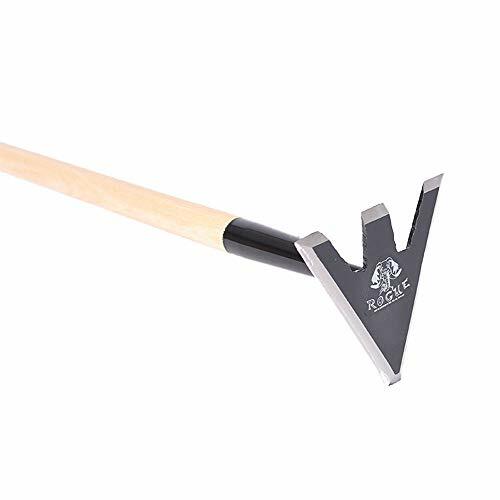 This original stirrup-style hoe design is manufactured with a heat-treated, self-sharpening blade that drastically cuts down the amount of time you’ll be spending taking care of your garden. The open design of the blade allows you to take care of weeds without struggling to move a ton of extra soil, making it easier than ever to take care of your garden. It features a 54-inch hardwood handle and was manufactured in the U.S.A.
Stirrup hoes are great for navigating around established plants because the edges aren’t sharpened, like many of the other hoes available, so you don’t have to worry so much about accidentally destroying your plants in your pursuit of weeds. This heavy-duty hoe is designed to get work done, whether you’re weeding or digging up the garden. It’s made from recycled agricultural disc blades and designed to be super durable. The seven-inch wide cutting blade has a long-lasting sharp edge and easily breaks up sod or clears weeds up to an inch in diameter. It’s highly durable, with a welded socket and blade to ensure this hoe won’t break. 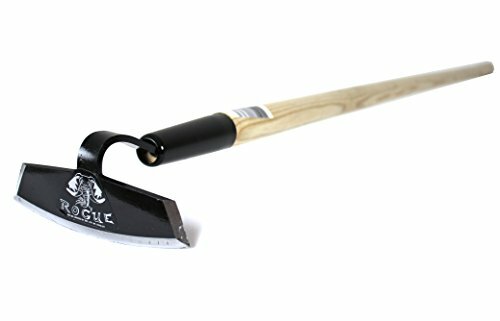 This garden hoe features a 60-inch hickory handle and is manufactured here in the U.S.A. It’s designed to be used with a chopping action, that builds up momentum with your movement to get the most out of your garden hoe without breaking yourself. The best way to do this is to chop the soil to break it up and then pull the handle back towards you in order to till. Another excellent option from Prohoe, this garden hoe is designed to cut and move dirt. It’s manufactured from recycled agricultural disc blades as well, so you can count on its quality and durability. The seven-inch wide head features sharp edges on three sides with the same long-lasting sharpness as all Prohoe hoes. Having three edges sharpened makes it easy to get under plants to break up the ground and you can easily navigate tight spaces by simply turning it onto its side. 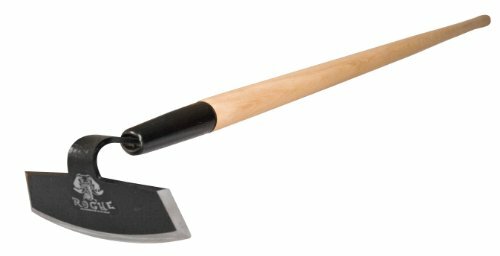 This hoe comes with a 60-inch hardwood handle and is manufactured here in the U.S.A. It’s a standard draw hoe, which is designed to be used with a pulling or scraping action. It’s not meant to be used deep in the soil, so this model is best if you’re doing surface level weeding. You may need to adjust the blade to get the most out of your Prohoe Rogue Garden Hoe. The Rogue Garden Hoe 575G is one of the most popular garden hoes on the market. It’s a “dirt digging machine” and its reviews attest to that. The blade is 5.75 inches of tempered steel with each of the three sides precision sharpened to stay sharp. The blade has a unique shape that allows it to cut from any angle, with precise cuts that easily fit between your plants. Rogue is so sure about the durability of this hoe that they offer a lifetime guarantee on the head. If it breaks, they’ll replace it with no questions asked. The hoe comes with a 60-inch hardwood handle and advertises itself as lightweight and balanced enough to be used by men and women of all sizes and strength levels. While it’s on the high-end price wise for hoes, those who’ve used it swear by it as an amazing tool that’s drastically improved their gardening experience. This do-it-all garden tool sets itself apart from the other hoes on this list. Manufactured with wide, hardened steel, the 6.5-inch blade is designed to be incredibly versatile, with a pointed end that works perfectly for planting, tearing up sod, or digging irrigation trenches. The broader side is great for pulling weeds or drawing dirt up to a plant and the three-fingered top functions as a rake for removing debris from your garden. Each of the edges is precision sharpened. This garden hoe features a 60-inch ash handle and is so versatile that it’s like having three different hoes. It can be used to chop, to sweep, or to rake, making it ideal for weeding, tilling, and planting. It’s a phenomenal tool that will be the last hoe that you buy, and it’s priced like the last hoe you’ll buy. But don’t worry, it’s worth it. 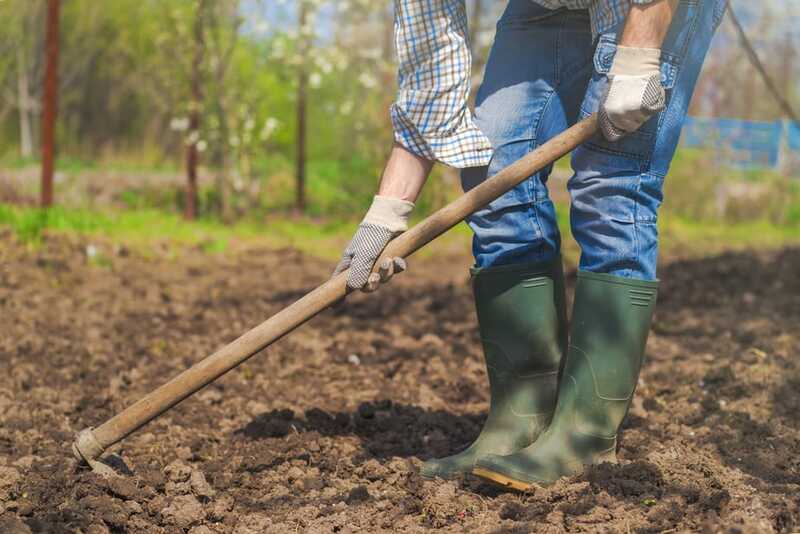 While buying a garden hoe may not seem like the most monumental purchase of your life, it will definitely have an impact on the quality of your gardening time. Choosing the right hoe involves looking at what your specific needs are. Will you only be using it for weeding? Will you be digging with it? What type of soil are you dealing with? Answering questions like these can direct you towards the best garden hoe for your garden. Since this is where you’ll be handling the hoe, it’s important to make sure you get a handle that you’re comfortable using. Most garden hoes come with a wooden handle, though you can also get some with lightweight aluminum or fiberglass handles. There are even models that have adjustable handles so that you can customize it to the length that is most comfortable for you! Here’s more information on handle types! Length is an important thing to take into account, as well. If you’re much taller or shorter than average, you’ll want to look for a handle that’s designed for use by someone of your stature. Most people can comfortably use the typical handle size, but if you have some concerns you should go ahead and do a test run in a local garden shop. The type of gardening you’ll be doing determines the type of garden hoe you’ll need. If you’re dealing with vegetables, you’ll often want a more sturdy hoe with a wider edge. If you’re looking for something to help maintain a flower or perennial garden, then choosing a thinner hoe that lets you work more precisely is necessary. There are, and we’re not exaggerating here, 48 separate types of hoe heads. These can be broken down into five categories: digging garden hoes, draw hoes, reciprocating, flat hoes, and sweeping hoes. We’ll discuss the differences of each, below. Digging hoes are the original garden hoe, dating way back to the early agricultural era. As the name implies, these hoes are designed for digging and tilling, using a chopping action. They typically have a heavy blade, or tines, to make it easier for you to gather momentum as you swing the hoe down, allowing you to break up the soil more easily. When you imagine the classic farm hoe, you’re imagining one of these. Unlike digging hoes, these are designed with a light blade because you’re not actually digging with them; they’re designed to be pulled in order to rip or slice at weed stems or uproot their roots. Despite being the most common type of hoe, many people use them incorrectly. In order to get the most out of your draw hoe, and save your back from a lot of unnecessary exhaustion, you’ll need to adjust the angle of the blade to match your height. There’s a great guide here and if you’ve spent a lot of time in your garden with one of these puppies, you’ll be amazed to discover how much better it gets once you’ve got everything adjusted! These are also designed for weeding, but with the additional feature of a moving head. The blade for this hoe has a pivot so it can navigate the soil at an angle. This allows you to prepare or weed your garden, even close to crop plants because you have a clear sense of where the blade is at all times. Stirrup hoes technically fall within the reciprocating hoes family, but they don’t always come with moving parts. The hoes, like the Flexrake 1000L Hula-Ho Weeder Cultivator, have an open design that resembles a stirrup. This lets them move through the soil without disrupting it as much as a typical blade. Because they typically have rounded edges with a blade only on the bottom, you can use them close to crops pretty safely. The blade on a flat hoe lies parallel to the soil’s surface, so you can take care of weeds by moving it backward and forwards. These hoes are designed to be used in soil that’s already loose and comes in a bunch of different shapes. You’ll just have to choose the one that fits your garden best. Dating back to only the 1980s, these hoes are the most modern on the market. They’re also designed for weeding in loose soil, with a variety of blade shapes that you sweep back and forth to cut through the weeds as you go. Founded in 1945, Flex Rake may be known mostly for their rakes, but they’re also the manufacturers of some of the most popular stirrup style hoes in the country. They take pride in their America-based production and in continuing to innovate in the agricultural field. 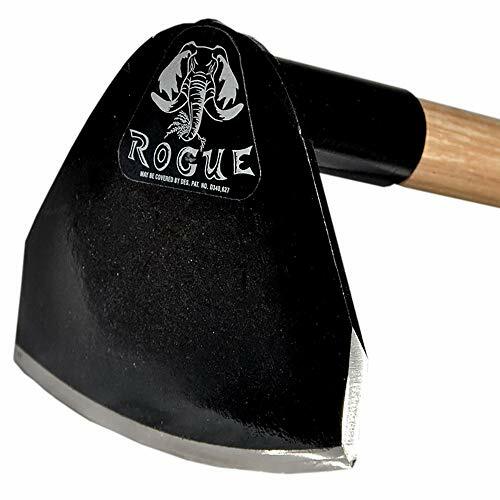 Rogue has over ten years of experience manufacturing high quality hoes, using recycled agricultural disc blades with sharpened edges that stay sharp. This family run company takes great pride in producing products that are used all over the United States and Canada. Prohoe is another family run business that’s been designing high quality and environmentally friendly tools for discerning farmers and gardeners all across the country. Q: Which garden hoe should I use? A: It absolutely depends on what kind of gardening you’re doing. They’re typically designed to work best under certain circumstances. For example, what type of soil you’re working in, how spaced out your plants are, and whether you’re looking to weed, till, or dig. There’s no one answer fits all when it comes to choosing the best garden hoe. Q: When was the garden hoe invented? A: There’s no specific date we can pin the invention of the garden hoe on. They’re one of the oldest agricultural tools and some of the oldest references to them date all the way back to 1100 B.C. in China. The most modern iteration of the hoe comes from a patent in the 1980s, however. Q: Can you replace a garden hoe handle? A: The specifics will vary depending on who manufactured your garden hoe. It tends to be a more complicated task than you would expect. But don’t worry if your handle has broken; it’s not the end. You can find a specific guide here for replacing your hoe’s broken handle. A garden hoe is an essential tool for your garden, no matter what sort of gardening you’re doing. It can turn hours of weeding on your knees into an hour that doesn’t break your back and leaves your garden looking better than ever with less work on your part. Hopefully, this guide has given you enough information to select the best garden hoe for your needs! If you’re looking for just one tool to do the job of many, the Backyard Garden Pros 65VW Rogue Garden Hoe Tool is a great choice, even though it’s on the pricy side. We feel it will be the last hoe you’ll ever need to buy.